Argentina’s football legend Diego Armando Maradona has accepted the position of coach of Dorados of Sinaloa, currently at the bottom of Mexico’s second division, and promised to look after the team like a father who tucks his son in. “I assume this responsibility like someone who has a child in his arms,” the retired football star said at a press conference on Monday in which he proclaimed to being mentally prepared to spend a long time with the team, reports EFE news agency. “To the people of Culiacan I say that we don’t come for a walk, we don’t come for vacations, we come to work, and I came to give my heart” he said. Diego arrived in Culiacan, a city about 1,200 km northwest of Mexico City, located in the heartland of the Sinaloa drug cartel, in a surprise move that shook the foundations of Mexican soccer and upon his arrival caused seismic emotions in the city of the state of Sinaloa. The ‘golden boy’s’ challenge will be tough as the Dorados have only three wins, three draws and three points in the Apertura 2018 tournament and occupy the penultimate place, with not much of an offense, two goals in six games, and a defense that needs improvement. Maradona will head the Dorados’ first training session this afternoon and said he will try to instill a philosophy of play based on ball possession and attack, which he hopes the team will practice on Sep. 17 when his team will host the Cafetaleros of Tapachula, the last team in the rankings. 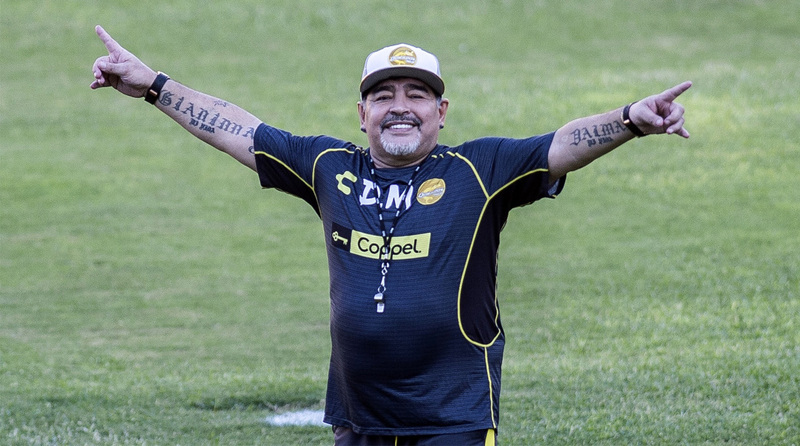 Maradona confessed that by coming to Mexico he turned down important proposals in Argentine soccer and offers to lead the Bolivian and Venezuelan teams, and his hope is to make the Dorados a winning team that goes up to the First Division.